A while back I installed a solar panel to charge a starter battery on a backup generator my grandmother has. In theory I should be able to leave the charger connected to the battery while starting the motor, but I didn't want to risk it, so I purchased a high current double pole double throw blade switch from eBay. It's apparently rated for 220 V at 100 Amp. The starting current shouldn't be anywhere near the 100 amp capacity and it's only running at 12 volt DC, which is lucky, because I don't trust the voltage rating on cheap electrical equipment. I thought it would be a simple process, but the terminals on the switch aren't quite what I needed. The photo below shows where the cable is terminated. It looks like the cable goes under the flat bar and is pressed against it by the rounded section when the screw is tightened, pulling the outer ring tight. This would be fine if the cables used were large, but the cables from the solar charger are small and would slip out. To overcome this I decided to remove their attachment method and drill a hole through the flat bar to connect a crimped eye terminal. To do this the switch had to be disassembled. It thought the way pressure is kept on the receiving contacts is interesting. A circular spring presses on both sides of the contact. This ensures a good electrical connection. Not really visible in the image below are the tiny cut outs in the contacts that keep the spring locked in place. To remove the contacts, the screws underneath the switch need to be removed. My plan is to discard the the left most part of the terminal in the image below, and drill a hole through the flat bar. The plan is to then solder a screw through the hole so that an eye terminal and nut can be attached to it. I'm still learning how to work with metal in this way, so it should be a bit of fun. An added bonus of having to pull the switch apart is that I discovered that the pivot point of the blade switch was loose. This part of the switch carries current from the common terminals to the output terminals, it's critical that a good electrical connection be made. It's held together by an aluminium rivet, to tighten the pivot point this rivet needs to be compressed. 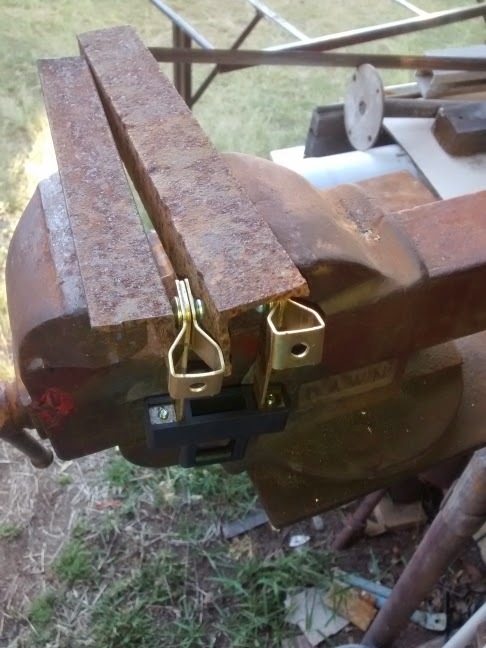 This was easy enough to do by placing it in a vice.